I don't have a lot to say! (Black Milk Swap, Sell and Buy! I don't have anything to blog about yet! I am awaiting packages and usually they come on Mondays and none came today, but that could have been because of the snow storm we had last night so it may come tomorrow, who knows! Well, you guys will because I will write a lovely blog! But yeah I really don't have anything to say. I guess I'll just talk about life because this is my blog and I do what I want on my blog! For all you Black Milk fans out there, I have recently came across the Facebook group Black Milk Clothing Swap, Sell and Buy ! This is a group that you have to be accepted to, and once accepted you can, as it says, Buy, Swap, or Sell Black Milk pieces! There are a few rules set in place to keep the group neat and tidy since there is currently 11,004 members! Which I'm sure all you sharkies realize is amazing because that means if you've been wanting to sell some clothing you don't wear someone will buy it! If you want to swap because you need a smaller or bigger size or just something different you can swap! And if you're looking for cheap Black Milk this is the place because it's been worn a lot of the time and you can find pieces that are discontinued! I recently purchased a pair of XS Aurora Skye leggings for $65 including shipping so I was very happy about this and they are on their way as I type! My dream pair is a pair of the Blood Splatter leggings, oh I'd kill for those! I really recommend checking this group out, you won't regret it! 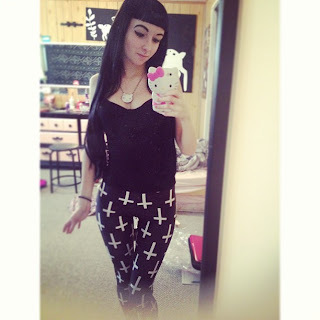 So I guess you guys should be expecting a blog about my new leggings, as well as a pair of wood heart tunnels I purchased, and a pair of Pentagram leggings! These blogs should be happening in the next week or two!